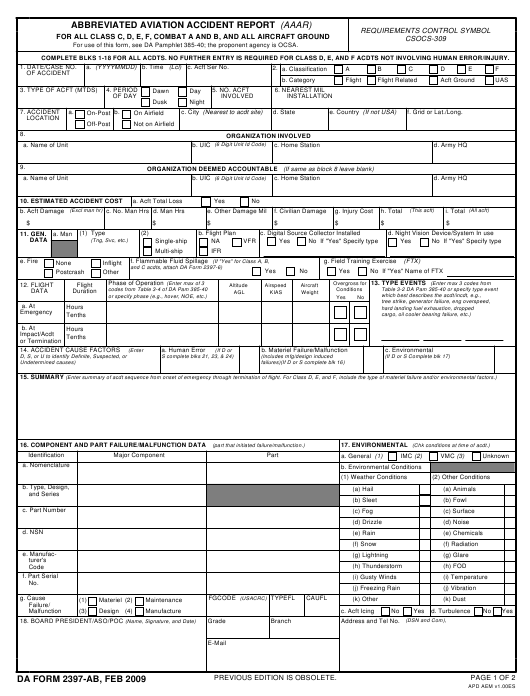 DA Form 2397-ab - also known as the "Abbreviated Aviation Accident Report (aaar) For All Class C, D, E, F, Combat A And B, And All Aircraft Ground" - is a Military form issued and used by the United States Department of the Army. The form - often mistakenly referred to as the DD form 2397-ab - was last revised on February 1, 2009. Download an up-to-date fillable PDF version of the DA 2397-ab below or request a copy through the chain of command. COMPLETE BLKS 1-18 FOR ALL ACDTS. NO FURTHER ENTRY IS REQUIRED FOR CLASS D, E, AND F ACDTS NOT INVOLVING HUMAN ERROR/INJURY. COMPLETE BLKS 19 - 26 FOR ALL CLASS C, COMBAT CLASS A, B, ACFT GROUND CLASS A, B, C, AND ALL CLASS ACDTS INVOLVING HUMAN ERROR/INJURY. b. Escape/Survival Difficulties (If "yes"